Second Friday of the month. Using a combination of breath techniques, dynamic postures, mantra, meditation and deep relaxation. 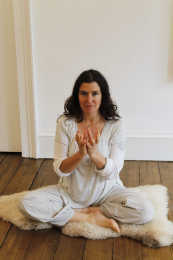 Sharon is a Kundalini Yoga teacher and practitioner with seven years experience and an intuitive astrologer with over 20 years experience. She is also a spiritual teacher, creative and ceremonialist. Sharon has a B.A. Hons. in Theatre from the Universities of Sydney and Western Sydney, and postgraduate qualifications in Gestalt Therapy from Swinburne University in Melbourne and Screenwriting from the Australian Film, Television & Radio School in Sydney. She trained as a Level Two Practitioner in Kundalini Yoga in Australia, China and France and is certified by the Kundalini Research Institute. She has also trained in Deep Memory Process for Past Life Regression / Soul Retrieval with Patricia Walsh in New York State, USA and Psychodrama with Antony Williams in Melbourne, Australia. Sharon’s background and experience includes writing and directing theatre, dramaturgy, and designing and facilitating experiential group processes. She has created, developed and managed multiple theatre and film projects including Plan B, a theatre project for men inside and on release from prison. Sharon has traveled the world visiting sacred sites and participating in ceremony with indigenous and non-indigenous people in Australia, Europe and the Americas. She supports the return of the power of the Sacred Feminine as expressed through the lost principles of truth, humility, integrity, inclusion, service to the whole and heart connected relating. She believes the healing of humanity will come through realignment with the wisdom of Mother Earth and Cosmos and can be cultivated in ceremonial circles through the power of the elements, symbol, song, mantra and prayer.